#InFocus #LandRights – Who owns how much land in India? Land is a critical economic and social asset as it is a key input to agricultural production, a source of income, and collateral for credit. Land is valued not just for material purposes or as a productive resource but also for symbolic reason in terms of identity, status and hierarchy within a social context. But how many people in India do own land? According to the recently released Socio Economic and Caste Census, 2011, over half of India’s rural households don’t have any agricultural land. The draft national land reforms policy released in July 2013 said 31% of all households are landless. That number is derived from a 2003-04 survey of the National Sample Survey Office (NSSO), but the definition of landless is unclear. According to NSSO, landlessness is defined as possessing land below 0.002 hectares, or 215 sq. ft. Assuming an average household size of five, the total landless population works out to be 200 million. The NSSO Survey 2013 reveals that around 7% of Indians control more than 47% of the country’s land while the rest 93% struggle to live with just 53% of the land. This shows that distribution of land in India is highly unequal – the rich and powerful own about half of the land while the poor and marginal continue to toil with whatever left for them. 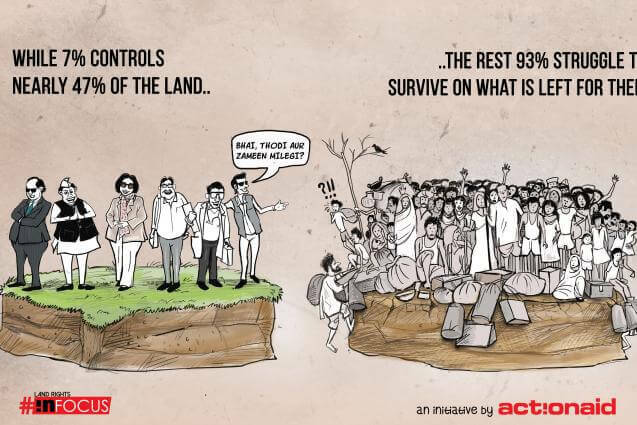 #InFocus #LandRights is an attempt by ActionAid India to highlight this issue and how it impacts the poor, marginalized and excluded communities with whom the organisation has been working for years across the country.